2018/19 Update: After more discussion with customers, I have decided to offer this variety this year. It is infected with a dahlia virus, most likely Dahlia Mosaic Virus. The effect of this virus is pretty minimal, other than causing some yellowing of the leaves. The plants still flower well and produce plenty of tubers. So, it is your call. If you grow a lot of dahlias and you want to keep them disease free, you should probably not buy this. If you are just growing a few dahlias for food, it might not matter to you. I will keep trying to clean up this variety and I expect that I will eventually be successful. 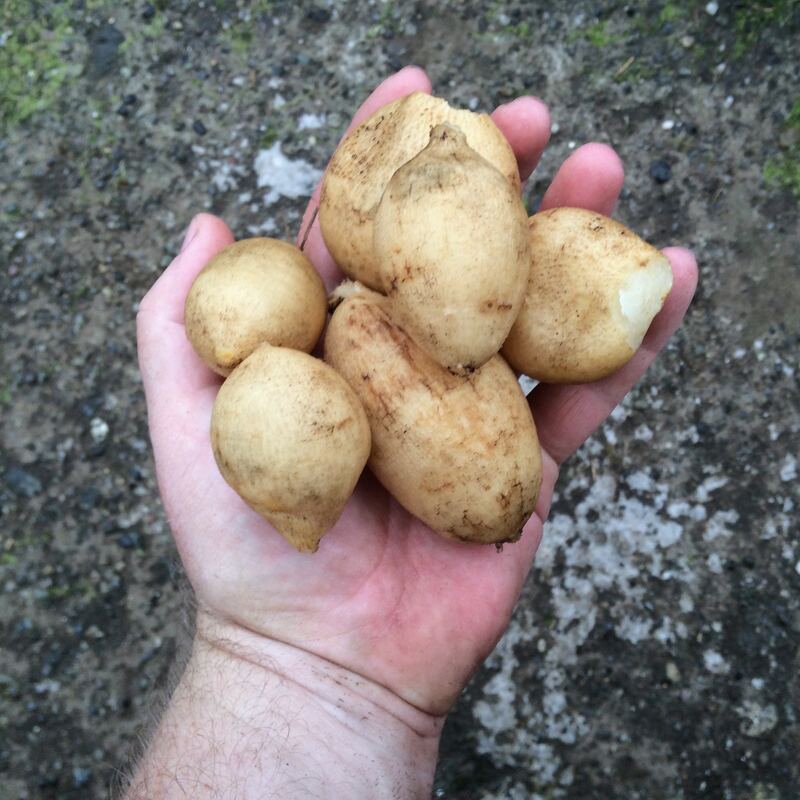 Yellow Gem is a high yielding variety with round to oval, off-white tubers. The tubers are firm and juicy, with a very smooth texture after cooking. Flavor is neutral in fall with just a hint of sweetness and floral aftertaste. By spring, the tubers are very sweet. Small, yellow “pom pom” type flowers. Grows to about 3 feet. An older variety, dating to 1914. Tolerates overwintering in wet soil better than most varieties, which helps to sweeten it. We had a hard time tracking down a source for this variety. It appears that many ornamental growers have dropped it in favor of more showy varieties. Perhaps we can help it to gain some popularity and live on as an edible.